this looks bad. Is there a plan here, Kate?" Oh, Kate, of course you've no plan. You're as bad as Clint is! Much of the mirth in HAWKEYE has been watching Kate Bishop, the younger, female and infinitely more clued-up Hawkeye, pick up the pieces of her mentor Clint Barton's balls-ups. They have been manifold, and Kate has been constantly peering over her sunglasses at the archer / Avenger with a mixture of recrimination and resignation. Now it transpires that our equally impetuous Ms Bishop is equally prone to pratfalls. I've described HAWKEYE as being a book about helping people starring the one guy who cannot help himself. We've now swapped coasts - New York for Los Angeles - as well as sharp-shooters' perspectives, but hilariously nothing has changed except the age and gender of the dive-in-first and wonder-what-on-earth-went-wrong wrong-righter. Okay, no, the artists have changed as well. 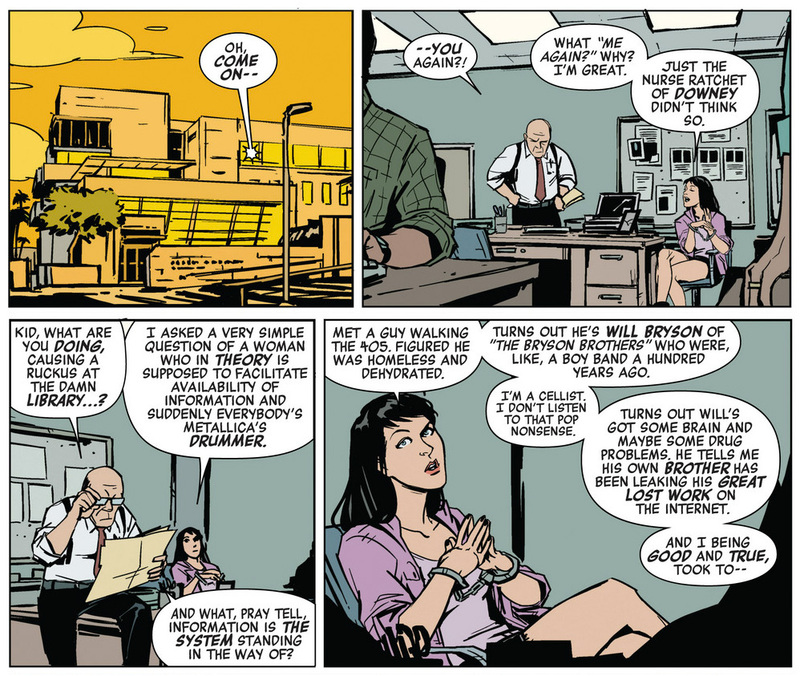 While Aja will return along with Clint Barton in HAWKEYE VOL 4, Kate's West Coast sabbatical is introduced by Javier Pulido who will delight Darwyn Cooke fans with a fine line in fashion coloured by Matt Hollingsworth as if L.A. was the brightest, most beautiful city with the freshest air in the world. As Annie Wu takes the driving seat things grow much darker, though the body language - both broken and indefatigable - can rarely be beaten along with the facial ticks which reveal exactly what our Kate's thinking long before she's uttered a word. Kate Bishop has set off for L.A. in a very flash car after finally losing patience with Clint as well as her cash-rich father. "Kate, let your mother get you a little something to drink." "Well, no, but I hope, maybe with time, you'll begin to think of me as --"
"You're three years older than me. We were literally in school together, Heather." "That was a nice time. Diazepam?" Lovely touch with the Jack Kirby Sue Storm portrait in the background there! "People can be so mean to each other and out here you can take bus tours to get better views of it all." But, as I say, this book at its heart is about helping people and, oh, it has so much heart! There's the tragic case of the Bryson Brothers who essentially were The Sixties to some. But the musical one, Will, became so absorbed in his masterpiece 'Wish' that he could never complete it to his own satisfaction so his production-orientated brother, Grey, could never release it. They're now old, ill, and at odds in a sequestered mansion. Fraction fills every page with these pop culture references both contemporary (which Kate mostly gets) and less so (mostly not, but please see above). It's a completely different approach to writing a superhero comic that this isn't one. Never has been. It's an action-adventure comedy of manners. Back to the heart of this book, and the first case Miss Bishop chances on involves her neighbours Marcus and Finch who, after waiting so long to be married, find their perfect day in danger of being ruined when the orchids of Marcus' dream-vision are stolen. You won't believe how fast that escalates and where it eventually leads to. Nor will Kate, but it all comes beautifully - yet appallingly - full circle. "Oh honey. You are my happily ever after."